8 club members enjoy rearranged hike! Having postponed the walk from the previous Friday due to rain, only 8 members were able to attend the rearranged hike. Everybody prayed for good weather and this time were not disappointed, the sun shone throughout. The group arrived at Symondsbury for coffee before a look around the church and then the first leg of the walk from the village to the base of Colmers Hill. Ascending the hill was not as difficult as some had thought and having reached the summit of 100m. the reward was panoramic views across Symondsbury and Bridport to the coast. From there, we descended and headed west to climb Quarry Hill which at 160m. looked eastward down over Colmers Hill. The following walk along Quarry Lane onto Monarchs Way was interesting with continuous views across to the sea with many butterflies and wild flowers, the odd buzzard, and,views in the opposite direction across to Colmers Hill which rose above the adjoining fields of barley. It was decided to miss out a part of the planned circular walk to return down a metalled lane past the Netherbury sheep dip to Symondsbury Manor for lunch and a rest following the morning's 4 mile and 2 steep climbs in preparation for the afternoon walk and climb to Golden Cap. Due to the waitress dropping the walk organiser's lunch the other group members abandoned him and enjoyed shopping in the nearby boutiques whilst he ate his belated lunch ! The drive to Langdon Woods car park didn't take long and after a pleasant woodland walk within half an hour the ascent up the steps to Golden Cap began. At 191m. this peak is the highest point of the South Coast with far reaching views to Portland in the east and Torbay in the west. 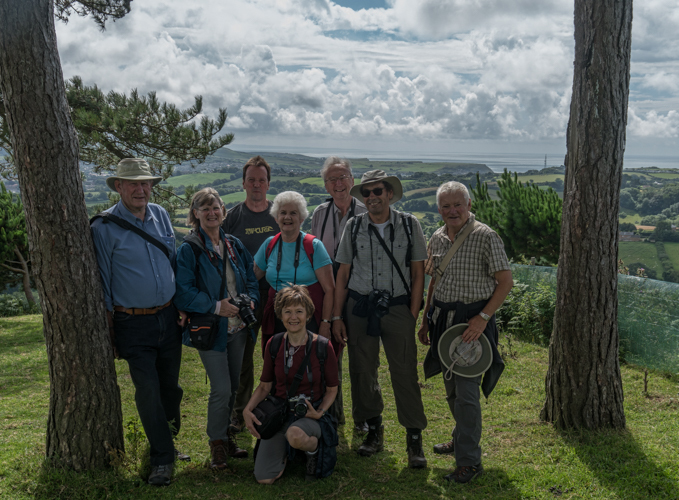 Again all members made the climb and had many opportunities for panoramic coastal and inland photographs. The walk was tiring but the satisfaction of having walked 6 miles and climbed 3 peaks with the resulting panoramic views and being with other Club members was well worth it.